Home/Blog/Are You Fostering Collaboration or Unhealthy Competition on Your Team? Everyone knows a bit of competition can give you a buzz. It’s normal in the workplace for colleagues to compete with one another. When it becomes unhealthy competition, then it’s time to worry. According to management research firm, CEB, 6% of Fortune 500 companies have already gotten rid of rankings, with the CEO of Accenture, Pierre Nanterme recently announcing his decision to axe the process and replace it with a “a more fluid system, in which employees receive timely feedback from their managers on an ongoing basis following assignments.” Here is the full interview where he breaks the news. A friend of mine recently recounted a difficult situation he encountered at work. His boss at the time had informed him and his counterpart that she couldn’t decide on who to choose for the newly created, more senior role. According to her, they just had to buckle up and prove themselves! Now, what type of environment do you think she created there? She may as well have put them in a boxing ring! Competition, not collaboration. 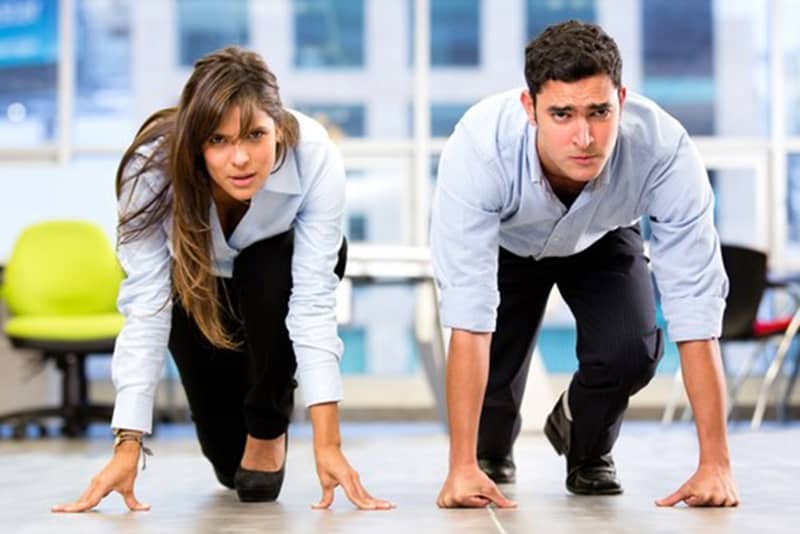 Of course, we all need a level of competition in the workplace to drive performance. The key is to know when we have crossed the line from healthy, constructive competition to that unhealthy, destructive competition that creates dysfunctional teams. Before we kick off our team coaching programme with a team, we assess the team as a whole and measure the balance between productivity and engagement in the team. Some teams score better on the productivity competencies than the engagement competencies, and vice versa. We find that unhealthy competition is present in teams that score low on the engagement factors such as trust, respect, camaraderie and constructive interaction. These are all raw materials essential for building collaboration and creating high performance teams. High performance teams are made up of small numbers of people with complementary skills who are equally committed to a common purpose, goals, and working approach for which they hold themselves mutually accountable. These teams have members who are also deeply committed to each other’s personal growth and success. Does this sound like your team? If not, your team culture probably fosters unhealthy competition and discourages collaboration. Make team meetings and social gatherings a priority. The key to building a team that has members who are committed to each other and open to collaboration is trust. I love collaborating, but I am also careful about who I collaborate with. To build trust, I dedicate time to building meaningful relationships with solid foundations of trust. This is practically impossible without time spent together, both formally in meetings and informally, over lunches and drinks. To find opportunities to collaborate, team members need regular opportunities to find out what everyone is working on, and to identify shared interests – both work-related and otherwise. Be a collaborative leader. Where possible, always ensure that team members are involved in decisions that impact the team. I recently facilitated a Vision and Strategy session for a leadership team in London. The team leader was amazed to see how powerful their collective vision was, compared to what he had started out with. Months later, he noted that the engagement of team members was considerably higher as they had co-created the team vision themselves, so were totally bought in. Walk the talk. Learn to share ideas, resources and even your best employees! As a Learning & Development Expert turned Executive Coach, I have come across my fair share of leaders competing with one another for talent. I have facilitated talent review meetings and worked with managers that were so keen to retain the talented members of their team to work for them, that they refused to put them forward for internal promotions. They did not want to lose them to other leaders and departments. Competition, not collaboration! In a number of cases, the organisation itself ended up losing the talented individuals altogether as they went on to find opportunities with other companies. If only you had shared! Study and guide your team culture. Every team has a culture – “the way things are done around here”. Whether you have consciously guided it or allowed it to effortlessly emerge, your team has a culture. Pay attention to it over the next few weeks and decide whether it needs a change. Then, get working on it. Ask for help. If you find that your team culture is not ideal or needs a little bit of attention, go ahead and work on it. More importantly, don’t feel like you have to do it on your own. Every leader can benefit from a mentor, coach, HR partner, or a trusted adviser who they can call on at any time. Don’t wait until things get out of hand before you work on creating a collaborative team culture and building a high performance team. Do you have a great team culture? Did you work on it or did it emerge on its own? What other advice can you give for building collaboration and avoiding unhealthy competition in the workplace? Remember, share, share, share! If you would like some help with assessing your team culture or, to proactively create a collaborative culture, contact me for an informal chat. If you found this article useful, please spread the word on social media, or send it to someone that would benefit from it.